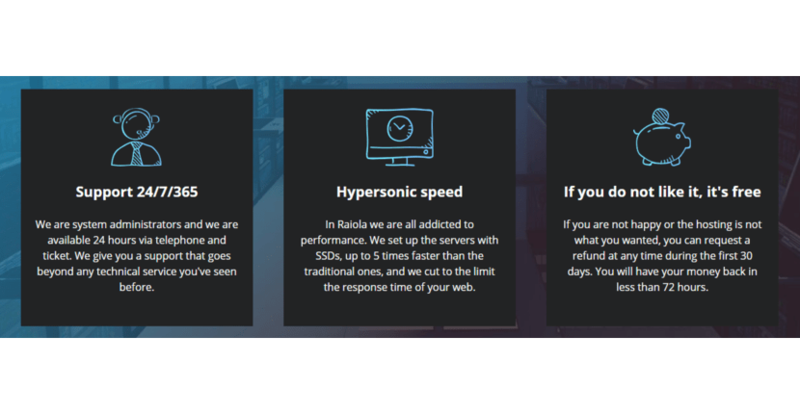 Raiola Networks Review 2019: Is Raiola Networks a Good Hosting? Raiola Networks is a Spanish hosting company with data centers located in three countries. Their service is best described as crafted for e-commerce business clients who need affordable, secure connection in order to run their online store properly. Raiola Networks is a Spanish hosting agency with data centers in Spain, United States, and France. They provide hosting services crafted with the needs of e-commerce business clients in mind. Using solid state drives and CloudLinux technology they provide fast page load times with stable connection to all their clients across the world. The first thing I noticed about Raiola Networks is that their website is entirely in Spanish. This shows that Raiola Networks focuses its attention on a Spanish speaking market. It took some time to translate the content in order to figure out what’s what. However, the revelation was impressive. The company offers shared hosting, VPS, and dedicated servers hosting option to its clients. The overall offer is versatile, but what really grabbed my attention is a number of customized shared hosting packages, one of which includes PrestaShop hosting. PrestaShop is a free software which is one of the most popular e-commerce solutions in the world. It allows you to use a number of customizable templates that allow you a fast deployment of your e-commerce website. PrestaShop hosting plan includes four packages with the most popular option of delivering 10GB of storage room, 200GB of bandwidth, with 60 percent of CPU capacity reserved for your online store. This package is more than enough to secure a stable connection and a decent number of monthly visits to your store. With cPanel you are able to perform a one-click installation of a number of free third-party apps that will help you run your business in an optimal manner. Additionally, there is a free SSL certificate, which you can’t find with many high-grade hosting services. The SSL certificate is important for the safety of your customers and the data stored on your website. The backups are performed daily, which is an additional safety measure in case something goes wrong. On the other hand, CloudLinux technology promises a 99.99% uptime, so there’s little chance you’ll experience downtime with Raiola Networks. Raiola Networks is a relatively small operation; they aim to attract customers by providing loads of resources for a small fee. The prices are just below the industry standard for a European hosting agency, while the offer stands above the usual service. With all the free features that they provide and the hardware infrastructure that promises a stable connection, this is one of the most affordable e-commerce options you can find on the market. The support service is one more reason why I think it pays to start hosting your website at Raiola Networks. They provide 24/7 phone and ticket customer support. The support team is very professional and know how to fix even the most complicated issue. They do not have Live chat, but once you give them a call, they will help you and address you in English. Raiola Networks is a reasonably priced, well-equipped, highly approachable hosting service most valuable to e-commerce clients. They offer a solid set of features, even going beyond the standard service with a technical support service that works around the clock and always has a simple solution ready. Wondering how Raiola Networks stacks up against other Web Hosting companies? Enter any other Web Hosting company and we will give you a side-by-side comparison.